MARBELLA IS QUALITY. IN BAD TIMES, QUALITY HOLDS ITS VALUE. IN GOOD TIMES, QUALITY INCREASES IN VALUE. IT’S AS SIMPLE AS THAT. IF YOU BUY QUALITY, YOU SHOULD CERTAINLY CONSERVE YOUR CAPITAL AND YOU ARE QUITE SURE OF INCREASED VALUE OVER TIME. All over the financially shaken world, people agree that 2009 is time for a change. In Marbella, perhaps we should change our attitude when looking at property. Instead of thinking about money, let’s think about real value. Let’s think about how nice the house is or how splendid the view is from the apartment terrace. For too long, people on the Costa del Sol have approached property asking only the question: How much can I get for it three years from now? Even the old established estate agents, who have seen booms and busts come and go, refer frequently to “investment opportunities”. We all have come to look at things primarily in terms of their cash value. Well, an over-emphasis on that attitude is how we got into this mess in the first place. And when the bankers started doing it, the end became inevitable. A bank that lends money to people they know cannot pay it back has lost its head. Their only way out was to pass on the bad loans to other banks or investors, disguised as solid collateral. The same goes for the stockbrokers and investment companies, where young “geniuses” earned fat commissions for inventing products that no one could understand. And even more for those opportunistic real estate agents who fast-talked buyers into putting down payments on four apartments in order to get rich quickly in a rising market. When all the buyer wanted was a holiday flat to enjoy… Now we are all paying for it. All the numbers look bad. The stock market is down, the banks which made those bad loans are now in trouble because the people cannot pay them back and the houses the bank figured as security are now worth less than they were before. More people are out of work. On top of everything else, the pound has dropped to practically the value of the euro, making it much more expensive for the British to buy property in Spain. Furthermore, the recession is Europe-wide and worldwide. We have always figured that, if one country crashes, another country will be doing all right and will take up the slack in the Costa del Sol property market. Not this time. It’s the Perfect Storm. Everything imaginable has gone wrong, both in the virtual economy, which is stock market numbers, and in the real economy, where people can no longer buy cars, so the carmakers are going to the wall. And this means the factory workers are out of a job. So, what is there to be cheerful about? Well, everything real about Marbella is actually going up. One of the most important factors here is government investment in improving the quality of life. This investment had already started, before the Crash of 2008, as this will probably be known. The money flow began simply because it was our turn for State investment funds. The input has since been increased and spread wider as part of the measures to re-activate the economy. The national government, the Andalusian regional government and the Málaga provincial authorities are all pouring hundreds of millions of euros into improving basic services on the Costa del Sol. Let’s take a look at some of the things going on around Marbella. For many of us, the most noticeable public work project is the burial of the coast highway, the N-340, on its way through the town of San Pedro de Alcántara. This bottleneck has delayed and infuriated residents for years, but work on the massive tunnel project is finally underway. 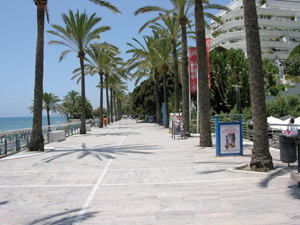 The Marbella seafront promenade, “El Paseo Maritimo”, is now divided into three disconnected parts: Marbella town, Puerto Banús and San Pedro de Alcántara sections. The sections are separated by rivers and streams. When the new culverts and bridges are in place to cross these natural barriers, people will be able to stroll along 13 uninterrupted kilometres of beachfront from Marbella-La Bajadilla harbour to the beginning of Guadalmina urbanization passing through Puerto Banús. More and better hospitals. The Costa del Sol regional hospital in Marbella now serves three times as many patients as it did when it opened 10 years ago. A major addition is now underway to meet the demand. Several new private hospitals have recently opened or been upgraded. Even before its final approval by the Andalusian regional building authorities, the new Marbella town development plan has been able to assign land for new schools and parks. Such public interest projects had been completely ignored under previous administrations. The new public schools come in addition to the excellent privately run international schools already existing. The coastal railway that presently runs from Fuengirola into Málaga city centre will be extended in the next few years at least to Estepona and eventually to Algeciras. Imagine getting on the train for a quick and easy ride to Algeciras and then catching the ferry to Africa. Roads throughout the interior of Málaga Province are being resurfaced and improved as part of the economic stimulus plan. New bypasses and super highways from Málaga heading north are nearing completion. The new roads will ease travel inland to the historic cities of Andalusia and to the ski areas of the Sierra Nevada. Municipal services to the many urbanizations along the coast are steadily being improved. Streets are being resurfaced, bus service is being increased, rubbish collection is improving and increased police patrols are protecting the zone. New water desalinization plants and improvements in the water distribution network along the coast will assure a steady supply of fresh water to the growing population. The City of Málaga is an explosion of new public works building projects. Most importantly for the foreign visitor, the Pablo Picasso airport is doubling the size of its terminals, improving the rail connections, and opening the second runway of the airport itself. In the city, construction of the new underground metro is advancing on schedule, and making a mess of traffic in and out of the city. This traffic will be greatly eased when the metro goes into service two years from now. The new high-speed train from Málaga to Madrid has already been in service for a year, attracting two million passengers, double its original prediction. 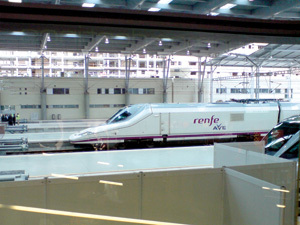 The AVE train puts Málaga at only two and a half easy hours from the nation’s capital. 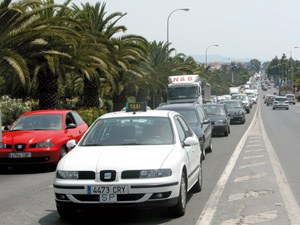 This makes it easier for well-to-do people from Madrid and other Spanish cities to visit their Costa del Sol property. This adds to the property’s value and we should remember that something like half the real estate market in Marbella is Spanish. Also in Málaga, the city is fast becoming a capital port for cruise ships. The special docking area and the shiny new cruise passenger terminal have encouraged several major lines to make Málaga their Mediterranean headquarters. 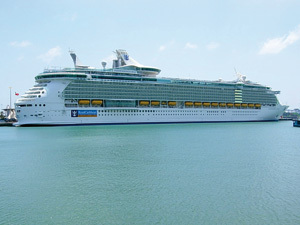 The world’s largest cruise ship, Independence of the Seas, now calls regularly. 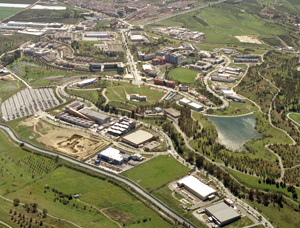 In a positive development that has nothing to do with tourism, the Technological Park of Andalusia, just outside Málaga city, has grown to more than a hundred high-tech companies working in fields such as computer processing and solar power. Málaga in fact is now one of Spain’s leading producers of solar panels and technology. This success has given rise to an initiative promoting the “Málaga Valley” scheme, to market the area as a centre of advanced technology, like California’s Silicon Valley. Authorities hope to attract more new companies offering even more well-paid jobs. As a major cultural city, Málaga offers orchestra, opera and art galleries and museums, including of course the Picasso museum. 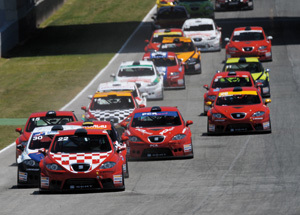 A little farther afield, access is easy to the Formula One circuit in Jerez as well as the Ascari racing circuit outside Ronda. What does this have to do with the Property Market? ALL OF THESE “REAL” ELEMENTS CONTRIBUTE TO AN IMPROVED QUALITY OF LIFE AND AN UP-MARKET ATMOSPHERE ALONG THE COAST FROM MÁLAGA CITY TO SOTOGRANDE, WHERE THE RECESSION HAS SO FAR NOT AFFECTED THE POLO SEASON. All this year-round activity means that there is a solid core to local life, which means that high-end restaurants have at least some diners at all times of the year and do not depend entirely on visitors. This goes for shops, suppliers and all the services we associate with a pleasant lifestyle. Marbella is not simply a summer resort. It is a functioning resort city with a life of its own that does not depend entirely on tourism. The population of Marbella is officially 130,000 registered citizens but official estimates of the real population are more than 300,000 full-time or parttime inhabitants. And the bottom line is that a functioning real economy means that the property market is never going to crash down to zero as it might in a purely resort area. Further, in an area like Marbella, many of the well-to-do owners have the resources to wait out the downturn even if it causes them some problems. They will not sell their properties at fire-sale prices because they do not have to. Several Marbella property agents report that they have received ridiculously low offers from aggressive bargain hunters who may try to buy a property for half of the price asked, for example. These agents, who are long-established and who know their clients very well, often do not even pass on these very low offers to their sellers. The agents also report that, although sales are fewer and farther between and are basically limited to quality properties in the best locations, interest remains brisk. They note that enquiries by Internet or in person have not slowed in 2008 and have actually increased during the last quarter of 2008 compared to the same period in 2007. So at least some buyers are out there and will eventually purchase, once they realize that price drops have already occurred and are now factored into the asking prices. One agent also pointed out that there is one bit of financial bad news that is actually beneficial to a British seller of Marbella property. That is the drastic drop in the value of the pound, from almost 1.5 euros down to just about one euro to one pound. This is nasty if you are a Briton wanting to buy in Spain, but if you are selling your Spanish property to return to the UK, the euros you are paid will change into substantially more pounds than last year at this time. We are preparing this report in early 2009 and of course we cannot predict how exchange rates may fluctuate during the rest of the year. There will be a few genuine distress sales from private sellers who absolutely have to have some cash and are prepared to take a loss. Developers selling new properties will make even better offers, but they will not drop prices to ridiculous lows. Prices in general will not rise either. There are buyers out there but they are still watching to see whether prices drop even more. When they realize that this is the bottom, they will put their money down and particularly in the case of property which because of its location and quality cannot be reproduced and is therefore unique. Mortgages will become cheaper as interest rates fall. This is already happening as the Euribor, the euro base-lending rate, falls through two per cent. The only problem is that the cash-strapped banks now make getting a loan very difficult. They have regressed to the old joke that a bank is an institution that only lends money to people who don’t need it. Meanwhile, all those public works projects will continue to add real value to your property. Because the government finances them, they will continue even if the recession worsens. Finally, we can almost safely predict that 2009 will bring the final approval of Marbella’s new urban development plan, the long-awaited PGOU, which will legalise almost all of the properties built with dodgy permits in the boom. This building plan, once cleared by the Andalusian regional government, will bring a new level of security to the area. Stay calm and wait. Your established estate agent has the best take on what will be a realistic asking price in today’s market for your particular property. In the middle price ranges, many sellers have cut about 20 per cent from what they hoped to get a year ago. High-end properties usually offer smaller reductions. However, you need to consult your individual case with an experienced agent. Do not lose heart. The buyers who remain in the market are very interested in Marbella and they will gradually work up the nerve to actually make a purchase. There is a significant number of potential investors who are now frightened of the stock market and want to put their cash into a real investment like property. They will soon realize that now is a good time to buy in Marbella. Keep in mind that, even after reducing your price to a realistic level, you are almost surely still making a profit if you have owned your property for more than two or three years. Finally, your property remains a good investment, both for real value and for monetary gain. Here’s one more reason why: When governments bail out the banks and pour money into stimulating the economy, they do this by printing money. This means that the money, which is a necessary crutch right now, will be worth less in the future. When the euro is worth less, prices begin to rise. This is called inflation. Inflation is the unavoidable down side of pumping money into the system. But it means that your real and valuable asset, your Marbella property, will be worth more money in the medium or long-term future. Now is the time to buy. See Point 4 above in Advice to Sellers. You can buy real value in Marbella today at a discounted price. This real value simply has to rise in price over the medium term. Marbella remains a good investment. Quality always is. Find the right estate agent. Pick one who has seen booms and busts before and who will advise you carefully on your particular needs. For the long-established agent, Marbella is a small town, where they know the market, they know the properties available, and they know the sellers. If you are looking for a private re-sale, the established agent will know the best offers and if you want a new flat from a developer, this agent will know which developers are offering the best deals on quality property. DIY. Do It Yourself. Do not think that you can read an article saying, “The market is down” and make yourself a tidy profit. Do not think that you know a property, even if you make a “virtual tour” on the Internet. That tour does not show you the noise from the highway, for example. If you are going to put down half a million euros, perhaps you, in person, should take a good look around with that experienced estate agent we mention in Point Two. The slow market for 2009 is basically good news for buyers. All types of property are available at reduced prices in all areas of the Costa del Sol. For those looking to purchase somewhere near Marbella we can distinguish a number of different zones and types of property. These range from high-density areas such as Calahonda, halfway to Fuengirola, where you can find holiday flats for under 200,000 euros, to high-end estates in the hills above Marbella, where two and-a-half to five million euros will buy you a villa on a nice piece of land. A very nice piece of land. Starting to the east of Marbella, on the beach halfway to Fuengirola, is the town of La Cala, which has become a sort of little England in the last few years. The local public school in fact has as many foreign pupils as Spanish ones, making it willy-nilly the first public international school and not at all a bad place for a family to start a new life in Spain. Just to the west, the long-established developments on the giant Calahonda estate, including both beachfront and hillside, have experienced an amazing building spurt over the past few years. Do not be put off by what appears to be an entire hillside covered with stair-stepping blocks of flats. Once you are inside most of the apartments, the views over the sea to Gibraltar and to Africa are fantastic. You can find holiday flats at less than 200,000 euros and elegant penthouses for a million euros. The succeeding areas towards Marbella are consolidated urbanisations that stretch inland over the hills to make a pleasant suburban landscape. 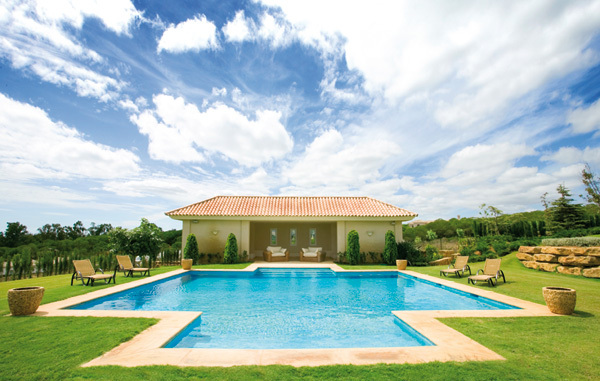 Apartments, townhouses and detached villas are available in a wide price range. Most of the estates here have grown slowly over the years. We can mention Hacienda Las Chapas, Santa Maria Golf and Hills, Elviria, Las Chapas, El Rosario, Los Monteros, Bahia de Marbella, Santa Clara, Altos de Los Monteros, and Rio Real Golf. Then comes Marbella town itself, a thriving resort city with a registered full-time population of 130,000 that soars to more than 300,000 in the summer months. The city offers every amenity and every modern service, from computer experts to luxury automobile dealers, for its well-to-do inhabitants and visitors. In the hills behind Marbella reaching up towards La Concha mountain, the villas have fantastic views over the city and the Mediterranean sea to Africa and Gibraltar. Worth mentioning are the well established areas of Marbella Sierra Blanca, Cascada de Camoján, Rocio de Nagu?eles and Lomas del Marbella Club. From Marbella out to Puerto Banus, with berths for more than 900 yachts, the shoreline is known as the Golden Mile, lined with luxury villas and apartments. Following the basic maxim of real estate investment – Location, Location and Location – this would be the area to choose. From Puerto Banus inland, you drive through densely builtup zones to arrive in a few minutes at the famous Valley of Golf, where some excellent re-sales can be found bordering the golf courses. Some of the prime areas are Nueva Andalucía with the Aloha, Las Brisas, and Los Naranjos golf courses. Then comes the town of San Pedro de Alcántara and the long-established Guadalmina beach and golf development. Reaching up into the hills behind, we find the municipality of Benahavis, known for its restaurants and for being the Andalusian zone with the highest income level. In these hills are several exclusive estates such as El Madroñal and La Zagaleta, with its own helicopter landing pad. 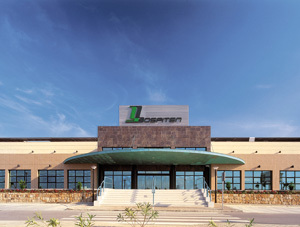 Others include La Quinta and Los Arqueros golf developments. Along the western coast towards Estepona, several very large and luxurious new golf developments have been steadily taking shape over the past 10 years. Growing areas are West Estepona and Manilva on the beach, as well as the beautiful white village of Casares in the mountains, with a municipality that stretches to the beach. One example of the upmarket development here is the very large El Cortesin golf project with a golf course, luxury boutique hotel, apartments and villas. The Costa del Sol then officially terminates at Sotogrande, in the shadow of Gibraltar. Sotogrande, home to the top-rated golf course in Europe, as well as a yacht harbour and polo grounds, continues its carefully planned growth just as it has for the past 40 years. So, even if new construction has basically come to a halt, we see that the Costa del Sol, and Marbella in particular, continue to grow in real value and will continue to improve over the next few years, even through today’s recessive times. Even though we have spoken against valuing things only in terms of money, it looks as if Marbella is still a good investment as well as being a nice place to live or spend your holidays.